Shrubs, bushes and hedges possess a natural beauty that can enhance the curb appeal of your home, while providing an attractive complement to lawns, trees, gardens and hardscapes, such as walks, patios and stonewalls. Many species of shrubs and bushes can be grown into a privacy screen, windbreak, or living “fence” along a boundary line; most varieties stay green and vibrant all year round. And shrubs, bushes and hedges can even increase the resale value of your home, but only if they’re well maintained and neatly trimmed. Fortunately, maintaining these landscape beauties is relatively easy, if you use a hedge trimmer. There are three basic types of hedge trimmers: gas-powered, corded electric, and battery-powered cordless. And each comes in various sizes, ranging from about 16 to 24 in., which is the length of the cutting bar. The type of trimmer you should buy depends on several factors, including the size of the hedge, the location of the hedge on your property, personal preference, and, of course, cost. 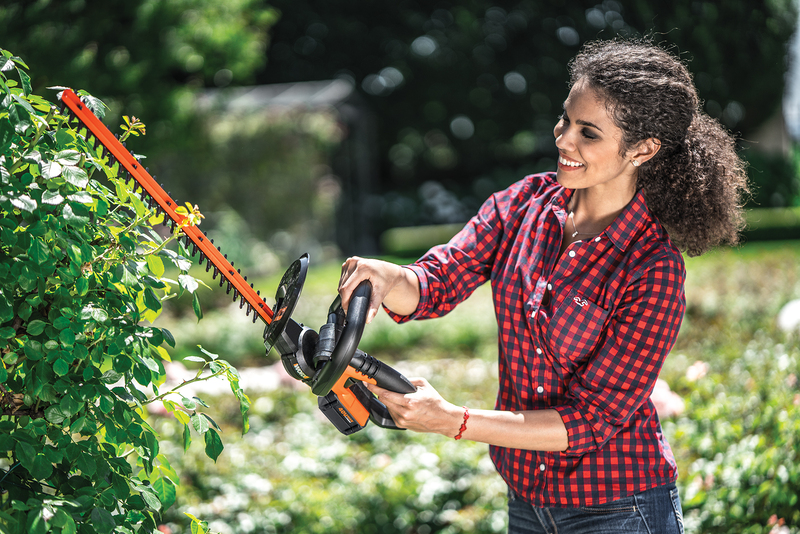 Gas-powered trimmers have powerful engines that cut the thickest branches quickly and cleanly. And because they’re not tethered to an extension cord, gas-powered trimmers allow you the freedom to work anywhere on the property. The downside of gas trimmers is that two-stroke engines require you to precisely mix oil and gas to the proper proportions. And they’re relatively loud and produce noxious fumes. In fact, some homeowner’s associations have put restrictions on gas-powered equipment in an attempt to maintain quiet hours. Prices start at about $180 and go as high as $550, but most gas models range between $290 and $360. Corded electric hedge trimmers are popular because they’re extremely easy to use, very quiet, and virtually maintenance free. There’s no pull cord, choke, exhaust fumes, or gas and oil to mess with. And no battery to keep charged. Simply plug the trimmer into an extension cord and you’re ready to start cutting. Electric trimmers are also very affordable, ranging in price from about $30 to $190, with most models costing between $50 and $75. The obvious disadvantage, of course, is that you’ve got to drag around an extension cord. That limits your range, but also creates one more hazard: be careful not to cut the extension cord! Electric hedge trimmers are best for homeowners with relatively small yards or shrubs in close proximity to an electrical outlet. Cordless hedge trimmers have been around for several years, but have only recently been taken seriously, thanks to the advent of powerful, long-lasting lithium-ion batteries. And they’re growing in popularity because they possess the best qualities of both gas and electric trimmers. A cordless trimmer provides the freedom to roam around the property untethered, like a gas trimmer, but it’s also much quieter than an electric trimmer. And it starts quickly, produces no exhaust, and doesn’t require engine gas or oil. When shopping for a cordless trimmer, keep in mind that performance, power and price are directly related to the size of the battery. Cordless trimmers are available with batteries ranging from 18 volts to 56 volts. Higher-voltage batteries have more power and longer run times, but they’re also heavier and more expensive. Cordless hedge trimmer prices range from $60 to $500, but most cost between $100 and $250. Hedge trimmers are easy to use and they cut with lightening speed. However, they’re also potentially dangerous. Hedge trimmers don’t differentiate between a branch and a finger. If it’s in the way, it’s going to get severed. That’s why it’s critically important to keep both hands on the trimmer at all times, and neverhold a branch with one hand while trying to cut it with the trimmer. The risk of serious injury is just too high. Be aware of your surrounding when using a hedge trimmer. Clear the work area of all obstacles, and look out for hidden hoses and wires. Be sure all pets and children are kept well away from the area. And when using a corded electric trimmer, be mindful of the extension cord at all times. Finally protect yourself by wearing eye goggles, hearing protection, work gloves, long-sleeve shirt, pants and close-toed shoes. These hedge-trimming tips and techniques are useful for most varieties of shrubs and bushes, regardless of what type of trimmer you’re using. And note that most formal hedges will need to be trimmed three or four times annually to maintain a neat, manicured appearance. Informal hedges, which are allowed to grow into a more natural shape, will require trimming perhaps once or twice per year. Start cutting near the bottom on the hedge and work your way up toward the top. Move the cutting bar in a slow, steady pace. Allow the cutting action of the blades to do the work. And don’t try to cut too deeply into the hedge on the initial pass; you might lop off too many branches. Instead, make several shallower passes, trimming off just a couple of inches at a time. It’s also important to trim the sides of the hedge at an angle, so that it’s wider at the bottom and slightly narrower at the top. That way, sunlight can reach the lower branches and root system, which helps the entire hedge grow green and lush. Also, don’t trim hedges in early spring when birds are nesting. To cut the top of the hedge flat, hold the trimmer’s cutting bar perfectly level (horizontal) and slowly guide it left to right, then right to left. Hedge trimmers cut in both directions, but again, only trim off a little at a time. Small- to medium-size hedges can be trimmed to the desired height by freehand. But to accurately trim long hedgerows, it’s best to stretch a taut nylon line between two wooden stakes to represent the finished height of the hedge. Then guide your trimmer along the line to produce a straight, even cut. Then, separate the branches by hand and look deep inside the shrub for dead, diseased or damaged branches. If you find any, cut them out with bypass hand pruners. And trim hedges in the early morning or late afternoon to prevent the sun from scorching the freshly cut ends of the branches. If you need to trim really tall hedges, consider buying—or renting—an extended-reach hedge trimmer. This specialty tool is essentially a standard trimmer that’s attached to a long, adjustable shaft. It provides the easiest and safest way to trim tall branches without having to stand on a ladder. Click HERE to check out hedge trimmers that will help you trim your hedges like a pro! Let's talk about the specifics of trimming hedges and take a quick look at the various types of hedge trimmers available.